Almost a week after 41-year-old Indian techie Prabha Kumar was stabbed in Sydney, cops are still struggling to determine the motive behind the murder, as they rule out sexual assault or a hate crime. A Ganesh Nadar/Rediff.com speaks to the police. A week-and-a-half has passed since 41-year-old Indian IT consultant, Prabha Arun Kumar, was brutally stabbed to death while returning home from work in Westmead, a suburb in Sydney. Prabha Kumar, a resident of Bengaluru, was talking to her husband as she was crossing Parramatta Park, on the night of March 8 when the incident took place. An official from the New South Wales police told Rediff.com that substantial advancements had been made into the case and they had recovered CCTV footage from the park from the night of the crime and also gathered her phone records and witness versions. “However, details cannot be revealed,” said an official. When asked about the motive behind the techie’s murder, the police official said that they were still to identify a motive. “It is imperative we do not speculate at this point in the investigation. Instead, we are keeping an open mind and conducting a methodical and meticulous investigation,” said the official. The police has, however, ruled out that the attack was a racially motivated incident. The official further added that there was no evidence to suggest that a sexual assault had taken place and also further ruled out robbery to be the motive for the murder. The post mortem has confirmed that Prabha died as a result of fatal injuries to her neck caused by a sharp bladed instrument. 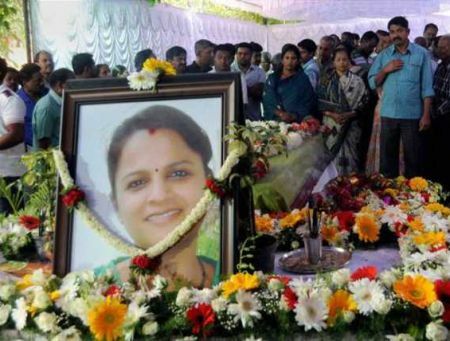 The police said they were probing Prabha’s background in great detail and as of now, there was nothing to indicate the victim was experiencing any trouble prior to her death that may have lead to her attack. Following the attack, the NSW police are closely working with the Indian community and assured that they would do all they could to find the culprit. Make in India push: Is it a flight of fancy?